Nestled between the Sierra Nevada mountains and the Pacific Coast Ranges is California's fertile Central Valley, home to one of the oldest and most beautiful flowering fruit trees. Unlike other flowering fruit trees that bear edible fruit, this tree's "pearl" is the delicious nut found inside the fruit, the almond. 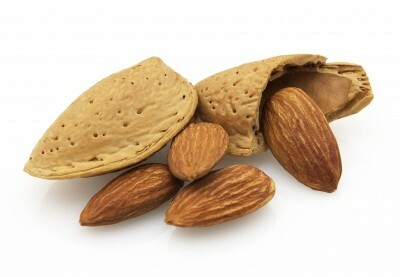 The almond is one of the most versatile nuts in the world. We eat many varieties in many diverse forms. Almonds are delicious alone as a nutritious snack, and they are a prime ingredient in home kitchens and in food manufacturing. Almonds enhance virtually every food they grace with their distinctive taste and satisfying crunch. California is the only place in North America where almonds are grown commercially. In the past 30 years, California's almond yield has quadrupled. More than 450,000 acres in the lush San Joaquin and Sacramento valleys are under almond cultivation, stretching 400 miles between Bakersfield and Red Bluff, California. Almonds are California's largest tree nut crop in total dollar value and acreage. They rank as the seventh largest U.S. food export. Approximately 6,000 almond growers produce 100 percent of the commercial domestic supply and more than 70 percent of worldwide production. Over 90 nations import California almonds. Overseas, Germany is the largest market for almonds, consuming about 25 percent of the export crop, followed by Japan at about 12 percent. Other major importers include the Netherlands, France, the United Kingdom, Canada, India and Spain. The Pacific Rim nations are a rapidly growing market for California almonds. Copyright© 2013 Waterford Nut Co. All rights reserved.